Special recognition for S&K employees at NASA - S&K Technologies, Inc.
Sylvia Paden and Lana Rouse receive their award for hard work on the Orion Program. Sylvia Paden, Project Specialist, and Lana Rouse, Project Specialist Back-up, received an achievement award for their efforts in delivery of Capsule Parachute Assembly System (CPAS) data to the Orion Program and Lockheed Martin in support of EFT-1 verification. The CPAS Project assembled a total of 57 data deliverables that contained well over a thousand individual files. For most of these deliverables, Sylvia and Lana had to create a deliverable cover sheet that described the content of the delivery and compress many files into a singular ZIP format file. Because of changes in the system used by the Orion Program to accept data, Sylvia and Lana had to create many of these ZIP files and deliverable data packages twice. The overall effort became much larger than originally planned and took much more time than had been allotted. Sylvia completed the task very quickly and helped to get all data delivered to the Program for verification. Silvia and Lana are part of the S&K Global Solutions EPIC project team based in Houston, Texas. Read more about the Capsule Parachute Assembly System and a recent test here. 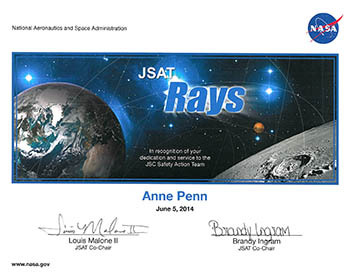 Anne Penn, Configuration Management Specialist, received the “JSAT Rays Award”. This award recognizes the official JSAT Representatives for the various organizations for our service and support to the JSAT during the past year and our commitment for the upcoming JSAT year. There was a group picture taken and I’ll forward either the picture or a link once it is distributed. After the monthly All Hands meeting, the EPIC Team gathered for a group picture, even though not all 80+ people were present. 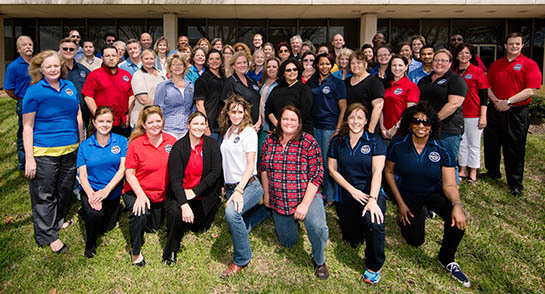 EPIC has supported the Engineering Directorate at Johnson Space Center since February 2013. The S&K Global Solutions EPIC Team in 2014. The Team has achieved many successes in our short contract period so far, including testing of the Advanced Docking System with six degrees of freedom as a new way to dock at lower closing velocities; testing the first Automated Landing and Hazard Avoidance Technology (ALHAT) “closed-loop” free flight test for Morpheus; completing acceptance testing and delivery of the ISS Simplified Aid for Extravehicular Activity (EVA) Rescue (SAFER) flight unit for crew member self-rescue in the event of separation from station; as well as completion of the first major IT project upgrading from SQL Server 2008 to SQL Server 2012 in the Engineering Directorate’s Data Center and accepted recommended by EPIC Data Management personnel to consolidate documents for potential savings of up to 77% reduction in documents with overlapping content.